Winter is not just about building the greatest snowman or playing with the snow. Although it may sound merry to anyone, some homeowners are burden with the pile of snow. Have you ever had your car stuck in your driveway because you can’t get it out? Well, good news for you because we’ve compiled the top 8 best snow shovel available in the market today. The following are the most durable, ergonomic, and innovative snow shovels that every homeowner must have. First, we have the 30-inch poly blade snow pusher from Garant. This snow shovel is superior in durability and features a polyethylene blade for long-lasting use. The D-grip handle is ideal even for a gloved hand. The wide blade is suitable for pushing snow out of large surfaces. It also features a hardwood handle that absorbs shock, perfect for heavy-duty use. For painless snow removal, you can make the most out of this product. Thanks to its sturdy handle and robust hardware, removing the snow out of your driveway has never been easier. If you want to have a quick and simple clean-off, this heavy-duty snow pusher in yellow color is the one that you are looking for. Next, we have the Dakota SnoBlade. 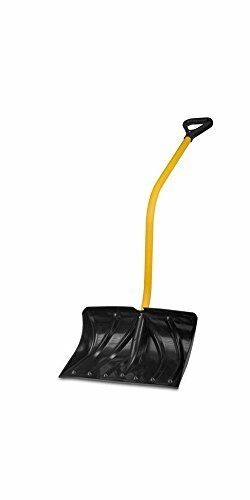 If you don’t want to burden yourself with a heavy snow shovel, allow us to present this unique-designed snow shovel is perfect hassle-free snow removal. In just one push, you can remove a tremendous amount of snow thanks to its 36-inch wide shovel blade. If you are struggling with heavy snow in your property, we highly recommend this product. All you need to do is to push the shovel, and you can move the rest with ease. Even though it has wheels, changing directions when cleaning is just a breeze. You can turn the Sno-Blade 180-degrees, and the snow is piled to the other side. This snow shovel is easy to store. You can even hang it on the wall for better convenience. 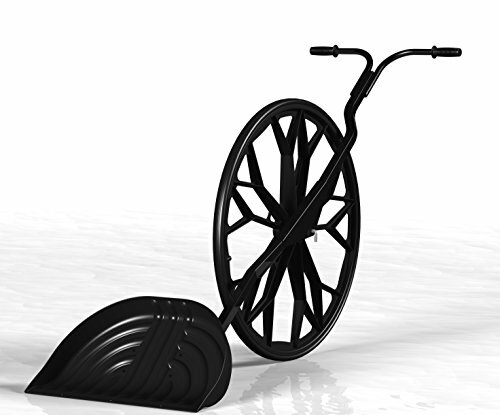 Introducing the snow wolf commercial wheeled snow shovel from Structured Solutions. This snow shovel will automatically catch the attention of anyone because of its unique structure. It’s not only unique-looking, but it’s also highly functional. Should you want to remove thick piles of snow in your yard or garage, this is the perfect choice for you. Compared to traditional shoveling of snow, it can clean up to three times faster. What we like about this product its added safety features to lessen the risk of injury. You don’t need to exert a lot of effort when cleaning your driveway thanks to this wheeled snow pusher. It can outsmart the performance of commercial snow blowers without the hassle of maintenance or noise. The long handle is made of high-quality metal while the wheel and the blade head is made of plastic. All you need to do is master the flipping of the snow shovel, and you’re good to go. 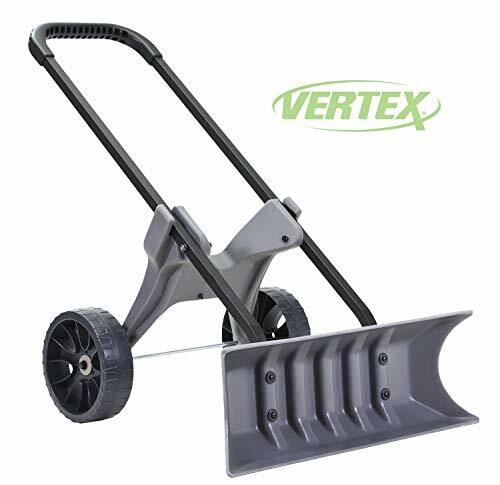 This heavy-duty snow shovel from Vertex is built to last. Thanks to its 30-inch poly snow blade with 15-degree side angle, shoveling out the snow in your driveway has never been easier. It comes with two 10-inch tires that never flattens out. This snow shovel also features a two-handed power grip that will place your body directly behind the blade so that you can maximize the power. 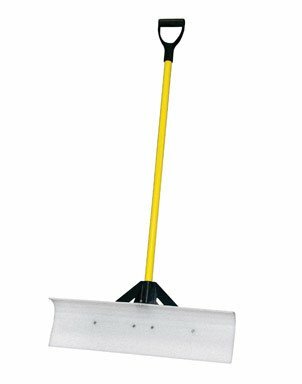 If you are dealing with 2-3 inches of thick snow in your property, this heavy-duty snow shovel is the item to use. Despite its large size, this snow shovel is also easy to store. The blade is replaceable should you want to use it in a variety of snow removal work. Its solid construction can withstand the upcoming winters to come. With proper use and maintenance, this product can last for a long time. It’s ideal for walks and drives that are wrapped in snow. Check out this alpha snow shovel from DMOS. It is built for extreme conditions of ice, stress tests, and other harsh weather. This superior snow shovel features a telescoping indexed locking shaft and strap slots, allowing you to take the product anywhere you want. It is built to last and perfect for shoveling out the snow in your driveway, garage, or just around your property. It is made of highly-durable materials, so rest assured that you can use it for many winters to come. 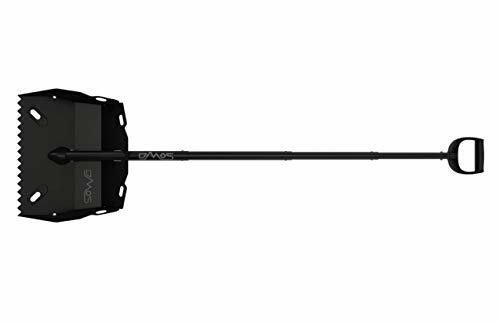 Compared to an avalanche shovel, it has twice the thickness, and it’s engineered for heavy-duty use. For quick and powerful shoveling of the snow in your area, you can quickly assemble the product and start using it right away. You can adjust the snow-moving tool from 18 inches up to 63 inches for your convenience. Despite its great durability, the product is surprisingly lightweight and easy to use. The patented serrated teeth can easily penetrate the snow. This 30-inch snow pusher from JM Enterprises Incorporation is the original snow plow made for all homeowners. Thanks to its UHMW poly blade, you can penetrate even the hardest ice and remove the snow without difficulty. It also features a patented fiberglass handle with reinforcement plug for superior durability. The simple bolt-together construction assures you that this product is bound to last for a long time with proper care and maintenance. The UHMW polyethylene delivers superior durability and impact resistance when cleaning. Since the pusher’s blade is made of a non-abrasive material, rest assured that it is safe on wood decks, sidewalks, steps, and patios. It’s easy to assemble. You can start using the product right out of the box. 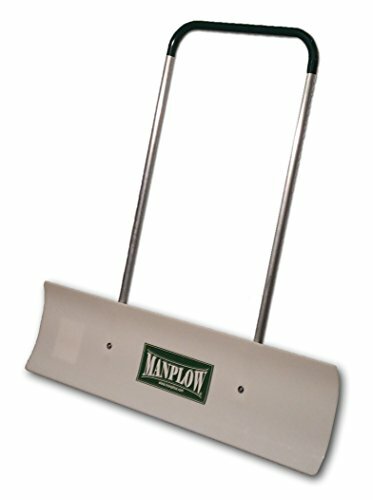 If you are looking for an ergonomic snow shovel that can last for a long time, you might want to check out this item from Manplow. Just in case you’ve already worn out the blade, you can rotate it clean again. It also features a U-shaped handle for superior strength and durability. The revolutionary blade is designed to slice the snow with ease. Even if it’s deep snow we are talking about, rest assured that this shovel can penetrate the ice and clean your driveway easily. We also like its tall blade that will allow you to distribute the snow and get the job done faster. The blade is made of ballistic rated polyethylene—ideal for scraping and giving you a clean finish. The manufacturer is best known for long-lasting products, and fortunately for you, this one is not an exception. Now deep snow and heavy ice will never be again a problem at your household. But if you are on a budget, we have the Suncast ergonomic snow shovel. The blade is made of plastic, and its anti-grip handle is ideal even if you have gloved hands. Thanks to its long metal bar, you can easily distribute the snow from one direction to another. You don’t need to break your bank to enjoy a high-quality snow shovel when you can have this. It’s easy to use and assemble. This product can act as a snow plow, snow shovel, and perfect for heavy snow removal. With proper care and maintenance, rest assured that this snow shovel can last for a long time. While winter brings the cold joy of magical flakes falling down your window, it also means shoveling excess snow out of your garage, door, and other places that might cause inconvenience. One cannot do without the right snow shovel in hand. Therefore, we’ve prepared an expert buying guide to help you choose the right snow shovel. After this guide is a list of the best snow shovels in the market that you should take a look at. What is a Snow Shovel? Snow shovels are designed to help you shove away the piles of snow in an organized manner. Snow shovels are durable outdoor tools that every homeowner should have, especially during the winter season. It is built to last for a long time and should be every bit as durable to handle thick slumps of snow gathered around your house or anywhere that might intrude the way. Snow shoveling can be your workout routine. If you’re too cold to hit the gym, worry not. All you need to do is grab your snow shovel and start shoveling the snow out of your garage. You didn’t clean your driveway, but you’ve also burned some calories in the process. Snow shoveling benefits your muscles and increases your endurance. It is easy to use. Snow shovels are designed for comfortable use. No manuals are needed when you buy one. Also, some snow shovels have an ergonomic handle that can allow you to shovel for long hours without causing extreme fatigue to your hands. It is an economical investment. Just imagine the inconvenience of not being able to pull your car out of the driveway because of the excess snow. A snow shovel is a must-have tool in every household, especially if the winter season in your country is heavy. When choosing a snow shovel, your existing level of power plays a major role. In order to get comfortable while shoveling snow for extended hours, you need to find a shovel that is suitable for your strength. For instance, if you are slender, a weighted snow shovel can be very difficult to handle. On the opposite side, if you are tall, a short snow shovel can be a pain to use during the operation. As mentioned earlier, if you want to last long shoveling snow out of your driveway, you should make sure that the handle of your snow shovel is ergonomic and comfortable to use. Take a closer look at the handle. It must fit your hands and must allow you to gain a strong grip on the tool when shoveling snow. Snow shovels with an uncomfortable handle can result in blisters after use. It must suit to the amount of snow that you are planning to shovel away. For instance, if you are only dealing with a thin layer of snow, a large blade size of your shovel might not be necessary. Always remember that the bigger the blade size, the heavier the shovel is. Medium-sized shovel blades are more comfortable to use and can carry a reasonable amount of snow in every dig. Your snow shovel should last for several winters to come. The last thing you want to experience is changing your snow shovel in every winter season. Choose a snow shovel that is made of durable materials such as metal, plastic, or the combination of both. However, remember that an all-metal snow shovel can be very heavy. But it is a strong material that can last for years. On the other hand, a snow shovel made of high-impact plastic is lighter and more comfortable to carry, but it is prone to damage by rocks and solid, stubborn ice that you’re dealing with. A combination of both materials can be ideal, with just the right amount of weight and offers superior durability.